New LV= research has revealed that thousands of landlords have failed to join a tenancy deposit protection scheme, leaving up to £4 billion of renters’ deposits at risk. The findings, from home insurer LV, reveal that 29% of renters who have moved in the last 12 months are not part of a tenancy deposit protection (TDP) scheme. Despite this being a legal requirement for landlords to ensure tenants’ deposits are protected by the Government approved scheme. Introduced in April 2007, the TDP scheme was set up to ensure that tenants’ deposits are not wrongly withheld at the end of a tenancy. The LV= research found that 48% of current renters are unaware that such a scheme exists, and a further 24% said they had heard of the scheme but didn’t know any details of it. All rental properties where a deposit has been taken since April 2007 are legally covered by the scheme, yet among private renters just 27% said their landlord is signed up. This means thousands of tenants could be at risk of having problems recovering their deposit, with over 77% of renters stating they had previously had some or all of their deposit money unreasonably withheld. The average deposit taken by landlords in the last 12 months is £670, so the potential loss is considerable. To counter this 13% of private renters surveyed said they had refused to pay rent towards the end of their contract, because they expected problems to arise with the return of their deposit. Under the TDP scheme, landlords must sign up with one of two schemes run by three Government approved financial companies. In the ‘custodial scheme’, the landlord pays the deposit to the scheme for safekeeping, and in the event of a dispute independent adjudication will decide who receives the deposit money. In the ‘insurance scheme’ the landlord retains the deposit and pays a premium to an insurer, who will return the money to the tenant if the landlord does not comply with the adjudicated outcome of any dispute. With both schemes, landlords have 14 days from the date the deposit is taken to inform their tenant of the scheme details. The LV= survey also revealed that 40% of people living in private rented accommodation don’t have any home contents insurance in place, despite the fact that rented properties are more prone to being burgled. Also, of those that do have home insurance, only 10% have a policy that includes a legal advice helpline, which could be used in the event of a dispute with a landlord. John O’Roarke, Managing Director of LV= home insurance, said: “This research highlights the need for the Government to raise the profile of this legislation and for it to be more strictly enforced, to protect both renters and landlords, as awareness is currently very low. Although the majority of private landlords are undoubtedly honest, our research shows that many tenants have experienced problems getting their deposit money back in the past, and are worried this could happen again. 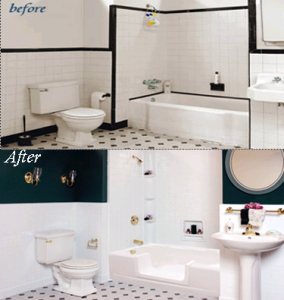 Eastern Refinishing Inc., the largest bathtub and tile refinishing company in North America, has operated for nearly 35 years, with the current ownership being 17 years. The business has representatives servicing most of the USA, with office locations in Boston, Buffalo, Conneticut, Portland, Sacramento, Phoenix, Oklahoma City, New Orleans, Florida, Atlanta, South Carolina, Nashville, Detroit, Virginia Beach, Richmond Virginia, Mariland, New Jersey, Chicago, Milwaukee, Rhode Island, Rochester & Wilmington Delaware. Eastern Refinishing has again expanded its product line, this time to include hot tub, spa and swimming pool restoration. Different swimming pools are painted with different coating systems, and these various systems can be incompatible with each other. Attempts by other companies to sell an all-inclusive pool paint have typically met with poor results. Hawk Laboratories, an industry leader in refinishing products, which Eastern Refinishing uses exclusively, has used its extensive knowledge database to develop an array of premium pool, hot tub and spa refinishing products to suit any application. CRP-12™ is a premium quality, chlorinated rubber based coating system designed to be applied to new concrete and gunnite, and surfaces previously coated with a chlorinated rubber-based product. Hawk CRP-12™ is a truly high performance product, giving the maximum durability and long lifespan required of commercial, hotel and apartment building swimming pools. FIBERBOND 5000™ is the toughest, longest lasting epoxy coating in the industry. Hawk FIBERBOND 5000™ is a two-component, satin finish, extremely high build coating system that will give unmatched performance on the most difficult surfaces, including water slides, and wave pools, where durability is a necessity. Ideally suited for fiberglass surfaces that need to stand up to abrasion and need constant U.V. light protection in demanding situations such as water slides. SPA-COTE™ is a premium, low-build, high gloss epoxy coating system for use below the water line. It performs well on spas, hot tubs, and therapy pools, as well as surfaces that have been previously painted with an epoxy coating. This tough durable finish is designed for constant immersion and is available in a wide range of colors. LP-14™ Water-Based Latex Pool Paint is the economical choice for light duty usage, and applications that prohibit thorough drying of surfaces before painting. This is an easy to apply, medium duty coating system designed to last several years. It gives the benefit of a very short return-to-service time, excellent for application during the swimming season, when downtime is a critical factor. It’s also great for concrete decks, walkways and outdoor fixtures. If you own a hotel, motel or apartment building, Eastern Refinishing can refinish your pool(s), tubs, sinks, countertops, ceramic tile, concrete surfaces and just about anything else! ER also does residential work covering most of the continental U.S. Owner of Eastern Refinishing, Charles Gayler, has worked with the industry’s leading manufacturer, Hawk Research Labs – Wood Dale, Illinois to develop a complete proprietary line of professional refinishing products. Utilizing a proprietary Acrylic urethane Coating System, Eastern Refinishing has taken longevity to new levels by being able to offer 5 year warranties on all refinished tubs. In fact, you can expect extended refinishing lifespan of between 10-12 years with proper care.